You’ve probably happened to catch your dog dreaming. You know, when he’s moving his legs in his sleep and I’m pretty sure there are some videos on the internet with dogs doing all sorts of funny things in their sleep. This means they are dreaming. The question is, how are they dreaming? Are they dreaming like us, humans? Do they have nightmares and wake up scared in the middle of the night? What really happens? Do dogs dream like humans do? First and foremost, let us make this clear to you! Humans are not the only beings who dream. Actually, there are studies that show all major vertebrates dream on a regular basis. 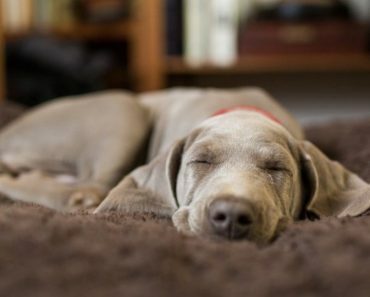 Dogs and other vertebrates go through some sleep cycles like us, humans do. From wakefulness to Rapid Eye Movement (REM) and non-rapid-eye-movement sleep, dogs dream mostly like us. REM is the most important part of our sleep cycle, since this is when the most dreams occur. In one experiment, scientists had a few lab rats run around in a maze all day while they were monitoring their brain activity. They kept monitoring their brain activity at night, when the rats were sleeping and saw that the same areas of their brains lit up. This proved that they were dreaming of the day activities, much like we humans do. So, this might also be true for dogs. What were you expecting? You thought your dog was dreaming of Nietzsche or Kant? No, he was just dreaming of his activities. Scientists found this out through a very strange experiment. They temporarily disabled dogs’ pons. These pons are responsible with paralyzing your muscles during sleep. Mostly, they just keep you in your bed, apart from the outside world when you are sleeping. I mean, just imagine if you would act out all your dreams, like jumping from a horse or moving your washing machine in the middle of the bedroom (Yeah, I’ve heard one of those stories). 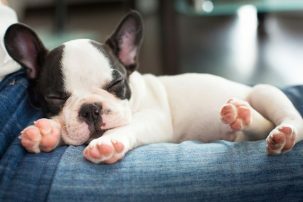 To help you better understand, think of your puppy twitching and moving his legs in his sleep. This occurs mostly because his pons are not fully developed yet. It could also apply to humans, infants or just old dogs. Researchers figured out a way to stop these pons from doing their thing. Dogs were free to act out their dreams under a carefully controlled environment, of course. The result was as expected: dogs dream about their daily, doggy activities, much like we humans do. We also have nightmares. Dogs can have nightmares, too. If you catch your dog acting out on a nightmare, just take care! We advise you not to wake him up, since you don’t really know what he’ll do to you out of fear. Just do like that famous saying: “let sleeping dogs lie!”. So, what does a dog’s dream look like. You can take your time to observe him carefully in his sleep. REM begins 20 minutes after falling into a nap. 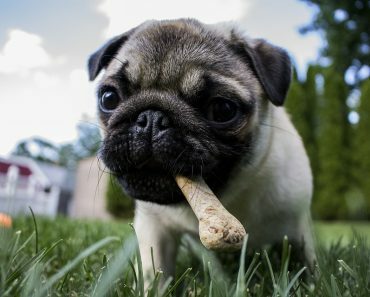 After this time, look at your dog’s paws. If they’re twitching or making sounds, it means he’s dreaming of running. Sometimes, his lips might be moving or he might even snarl a little in his sleep. You can only imagine his dream: running in the park, playing with other fellow dogs, chasing something. Build up on that! You’ll get to his dream! All you need is a little imagination and some knowledge of your dog’s favourite daily activities. There are some saying that dogs are also dreaming of their owners. Since they spend most of their time among their owners, this could be true, as well. So, just watch your dog while sleeping and you’ll see!